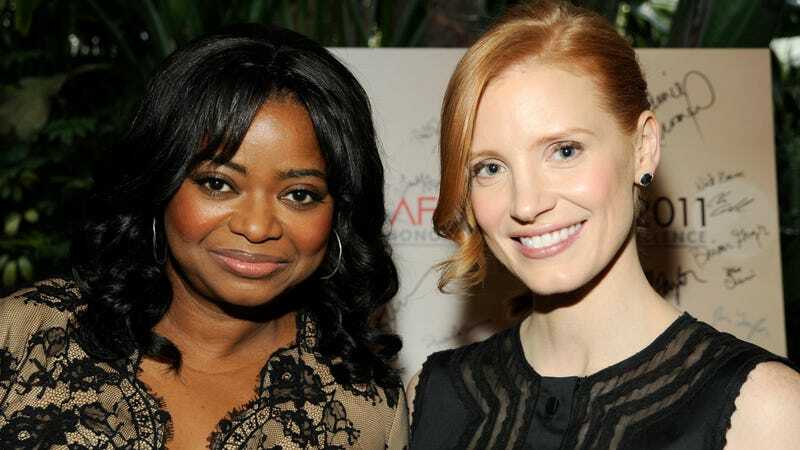 Former The Help co-stars Octavia Spencer and Jessica Chastain are teaming up for a new holiday comedy, Variety reports, which will be produced by Chastain’s company Freckle Films. According to Variety, the movie is about “two women fighting the elements to make it home for Christmas.” Incredible. Honestly, I love it. I’m not being sarcastic! What will a movie about the weather bring us? An entire movie in which the antagonist is “the inconvenience of holiday travel”? Will we see a 12-hour delay in LaGuardia? A sobering dialogue on the dire perils of climate change? An unexpected spell of psoriasis due to stress? I do not know, and can’t wait to find out. SCENE: Jessica stares at blizzard updates on Twitter while pacing the JetBlue terminal. Her old friend Octavia taps her on the shoulder. JESSICA: Oh my gosh, Octavia! OCTAVIA: Jessica! Wow, it’s been so long! JESSICA: Isn’t this blizzard crazy? OCTAVIA: We’re going to die here! JESSICA [laughing]: Well, we’re all going to die eventually. The holiday season two or three years from now can’t come quickly enough, in my opinion.